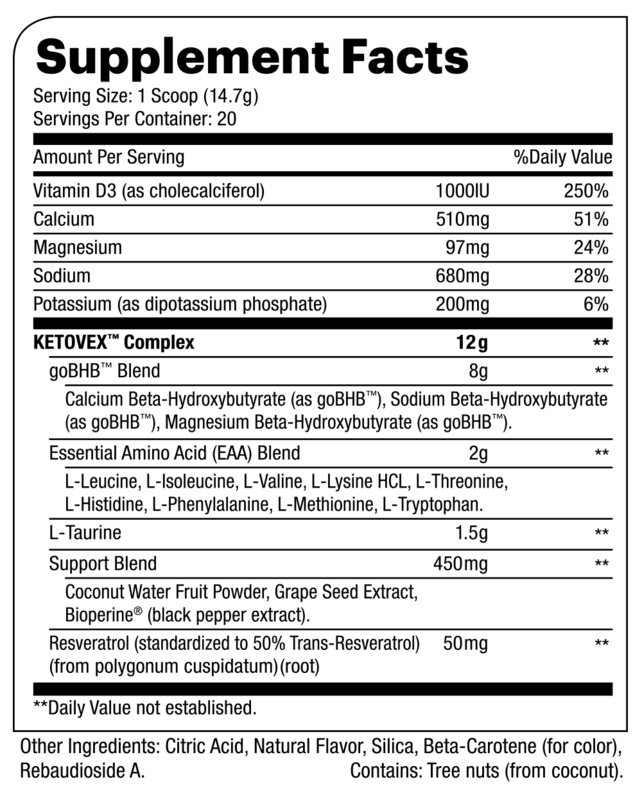 KETOVEX™ is a specially formulated product designed to work in combination with both Keto and low-carb programs. The combination of exogenous ketones in the form of beta-hydroxybutyrate (BHB), along with Essential Amino Acids (EAAs) and other key support ingredients, KETOVEX™ can be an exceptional addition to any exercise program. Suggested Use: As an adult dietary supplement, mix one scoop of KETOVEX™ with 8–10 ounces of water or your favorite beverage. This product may be used at any time throughout the day. Warning: This product is only intended for healthy adults, 18 years of age or older. Keep out of reach of children. Please consult your physician be- fore taking if you have any pre-existing medical conditions or are taking any medication. Do not use if you are pregnant or nursing. Discontinue use and consult your health care professional if you experience any adverse reaction to this product. Do not use if safety seal is broken or missing. Store in a cool, dry place.